No one exemplifies the model of the terrorist entrepreneur more clearly than Khalid Sheikh Mohammed, the principal architect of the 9/11 attacks. Khalid followed a long path to his eventual membership in al Qaeda. Highly educated and equally comfortable in a government office or a terrorist safehouse, KSM applied his imagination, technical aptitude, and managerial skills to hatching and planning an extraordinary array of terrorist schemes. These ideas included conventional car bombing, political assassination, aircraft bombing, hijacking, reservoir poisoning, and, ultimately, the use of aircraft as missiles guided by suicide operatives. Like his nephew Ramzi Yousef (three years KSM's junior), KSM grew up in Kuwait but traces his ethnic lineage to the Baluchistan region straddling Iran and Pakistan. Raised in a religious family, KSM claims to have joined the Muslim Brotherhood at age 16 and to have become enamored of violent jihad at youth camps in the desert. In 1983, following his graduation from secondary school, KSM left Kuwait to enroll at Chowan College, a small Baptist school in Murfreesboro, North Carolina. After a semester at Chowan, KSM transferred to North Carolina Agricultural and Technical State University in Greensboro, which he attended with Yousef's brother,another future al Qaeda member. KSM earned a degree in mechanical engineering in December 1986. Although he apparently did not attract attention for extreme Islamist beliefs or activities while in the United States, KSM plunged into the anti-Soviet Afghan jihad soon after graduating from college. Visiting Pakistan for the first time in early 1987, he traveled to Peshawar, where his brother Zahid introduced him to the famous Afghan mujahid Abdul Rasul Sayyaf, head of the Hizbul-Ittihad El-Islami (Islamic Union Party). Sayyaf became KSM's mentor and provided KSM with military training at Sayyaf's Sada camp. KSM claims he then fought the Soviets and remained at the front for three months before being summoned to perform administrative duties for Abdullah Azzam. KSM next took a job working for an electronics firm that catered to the communications needs of Afghan groups, where he learned about drills used to excavate caves in Afghanistan. KSM first came to the attention of U.S. law enforcement as a result of his small role in the first World Trade Center bombing. According to KSM, he learned of Ramzi Yousef's intention to launch an attack inside the United States in 1991 or 1992,when Yousef was receiving explosives training in Afghanistan. During the fall of 1992,while Yousef was building the bomb he would use in that attack, KSM and Yousef had numerous telephone conversations during which Yousef discussed his progress and sought additional funding. On November 3, 1992, KSM wired $660 from Qatar to the bank account of Yousef's co-conspirator, Mohammed Salameh. KSM does not appear to have contributed any more substantially to this operation. Yousef's instant notoriety as the mastermind of the 1993 World Trade Center bombing inspired KSM to become involved in planning attacks against the United States. By his own account, KSM's animus toward the United States stemmed not from his experiences there as a student, but rather from his violent disagreement with U.S. foreign policy favoring Israel. In 1994, KSM accompanied Yousef to the Philippines, and the two of them began planning what is now known as the Manila air or "Bojinka"plot, the intended bombing of 12 U.S. commercial jumbo jets over the Pacific during a two-day span. This marked the first time KSM took part in the actual planning of a terrorist operation. While sharing an apartment in Manila during the summer of 1994, he and Yousef acquired chemicals and other materials necessary to construct bombs and timers. They also cased target flights to Hong Kong and Seoul that would have onward legs to the United States. During this same period, KSM and Yousef also developed plans to assassinate President Clinton during his November 1994 trip to Manila, and to bomb U.S.-bound cargo carriers by smuggling jackets containing nitrocellulose on board. KSM left the Philippines in September 1994 and met up with Yousef in Karachi following their casing flights. There they enlisted Wali Khan Amin Shah, also known as Usama Asmurai, in the Manila air plot. During the fall of 1994, Yousef returned to Manila and successfully tested the digital watch timer he had invented, bombing a movie theater and a Philippine Airlines flight en route to Tokyo. The plot unraveled after the Philippine authorities discovered Yousef's bomb-making operation in Manila; but by that time, KSM was safely back at his government job in Qatar. Yousef attempted to follow through on the cargo carriers plan, but he was arrested in Islamabad by Pakistani authorities on February 7, 1995, after an accomplice turned him in. In January 1996, well aware that U.S. authorities were chasing him, he left Qatar for good and fled to Afghanistan, where he renewed his relationship with Rasul Sayyaf. Just as KSM was reestablishing himself in Afghanistan in mid-1996, Bin Ladin and his colleagues were also completing their migration from Sudan. Through Atef, KSM arranged a meeting with Bin Ladin in Tora Bora,a mountainous redoubt from the Afghan war days. At the meeting, KSM presented the al Qaeda leader with a menu of ideas for terrorist operations. According to KSM, this meeting was the first time he had seen Bin Ladin since 1989. Although they had fought together in 1987, Bin Ladin and KSM did not yet enjoy an especially close working relationship. At the meeting, KSM briefed Bin Ladin and Atef on the first World Trade Center bombing, the Manila air plot, the cargo carriers plan, and other activities pursued by KSM and his colleagues in the Philippines. KSM also presented a proposal for an operation that would involve training pilots who would crash planes into buildings in the United States. This proposal eventually would become the 9/11 operation. From KSM's perspective, Bin Ladin was in the process of consolidating his new position in Afghanistan while hearing out others' ideas, and had not yet settled on an agenda for future anti-U.S. operations. At the meeting,Bin Ladin listened to KSM's ideas without much comment, but did ask KSM formally to join al Qaeda and move his family to Afghanistan. KSM declined. He preferred to remain independent and retain the option of working with other mujahideen groups still operating in Afghanistan, including the group led by his old mentor, Sayyaf. Sayyaf was close to Ahmed Shah Massoud,the leader of the Northern Alliance. Therefore working with him might be a problem for KSM because Bin Ladin was building ties to the rival Taliban. According to KSM, the 1998 bombings of the U.S. embassies in Nairobi and Dar es Salaam marked a watershed in the evolution of the 9/11 plot. KSM claims these bombings convinced him that Bin Ladin was truly committed to attacking the United States. He continued to make himself useful, collecting news articles and helping other al Qaeda members with their out-dated computer equipment. Bin Ladin, apparently at Atef's urging, finally decided to give KSM the green light for the 9/11 operation sometime in late 1998 or early 1999. KSM then accepted Bin Ladin's standing invitation to move to Kandahar and work directly with al Qaeda. In addition to supervising the planning and preparations for the 9/11 operation, KSM worked with and eventually led al Qaeda's media committee. But KSM states he refused to swear a formal oath of allegiance to Bin Ladin, thereby retaining a last vestige of his cherished autonomy. At this point,late 1998 to early 1999, planning for the 9/11 operation began in earnest. Yet while the 9/11 project occupied the bulk of KSM's attention, he continued to consider other possibilities for terrorist attacks. KSM appears to have been popular among the al Qaeda rank and file. He was reportedly regarded as an effective leader, especially after the 9/11 attacks. Co-workers describe him as an intelligent, efficient, and even-tempered manager who approached his projects with a single-minded dedication that he expected his colleagues to share. Like Yousef, KSM reasoned he could best influence U.S. policy by targeting the country's economy. KSM and Yousef reportedly brainstormed together about what drove the U.S. economy. New York, which KSM considered the economic capital of the United States, therefore became the primary target. For similar reasons, California also became a target for KSM. KSM claims that the earlier bombing of the World Trade Center taught him that bombs and explosives could be problematic, and that he needed to graduate to a more novel form of attack. He maintains that he and Yousef began thinking about using aircraft as weapons while working on the Manila air/Bojinka plot, and speculated about striking the World Trade Center and CIA headquarters as early as 1995. Indeed, KSM describes a grandiose original plan: a total of ten aircraft to be hijacked, nine of which would crash into targets on both coasts-they included those eventually hit on September 11 plus CIA and FBI headquarters, nuclear power plants, and the tallest buildings in California and the state of Washington. KSM himself was to land the tenth plane at a U.S. airport and, after killing all adult male passengers on board and alerting the media, deliver a speech excoriating U.S. support for Israel, the Philippines, and repressive governments in the Arab world. Beyond KSM's rationalizations about targeting the U.S. economy, this vision gives a better glimpse of his true ambitions. Although Bin Ladin listened to KSM's proposal, he was not convinced that it was practical. Bin Ladin was receiving numerous ideas for potential operations- KSM's proposal to attack U.S. targets with commercial airplanes was only one of many. Thus, although KSM contends he would have been just as likely to consider working with any comparable terrorist organization, he gives no indication of what other groups he thought could supply such exceptional commodities. KSM acknowledges formally joining al Qaeda, in late 1998 or 1999, and states that soon afterward, Bin Ladin also made the decision to support his proposal to attack the United States using commercial airplanes as weapons. Bin Ladin summoned KSM to Kandahar in March or April 1999 to tell him that al Qaeda would support his proposal. The plot was now referred to within al Qaeda as the "planes operation." No one else but KSM, Bin Ladin, and Atef were involved in the initial selection of targets. Much of his activity in mid-1999 had revolved around the collection of training and informational materials for the participants in the planes operation. For instance, he collected Western aviation magazines; telephone directories for American cities such as San Diego and Long Beach, California; brochures for schools; and airline timetables, and he conducted Internet searches on U.S. flight schools. He also purchased flight simulator software and a few movies depicting hijackings. To house his students, KSM rented a safehouse in Karachi with money provided by Bin Ladin. The course in Karachi apparently lasted about one or two weeks. According to KSM, he taught the three operatives basic English words and phrases. He showed them how to read phone books,interpret airline timetables, use the Internet, use code words in communications, make travel reservations, and rent an apartment. KSM told them to watch the cabin doors at takeoff and landing, to observe whether the captain went to the lavatory during the flight, and to note whether the flight attendants brought food into the cockpit. Although Bin Ladin, Atef, and KSM initially contemplated using established al Qaeda members to execute the planes operation, the late 1999 arrival in Kandahar of four aspiring jihadists from Germany suddenly presented a more attractive alternative. The Hamburg group shared the anti-U.S. fervor of the other candidates for the operation, but added the enormous advantages of fluency in English and familiarity with life in the West, based on years that each member of the group had spent living in Germany. KSM played a key role in facilitating travel for al Qaeda operatives. KSM provided his operatives with nearly all the money they needed to travel to the United States, train, and live. The available evidence indicates that the 19 operatives were funded by al Qaeda, either through wire transfers or cash provided by KSM, which they carried into the United States or deposited in foreign accounts and accessed from the United States. KSM, Binalshibh, and another plot facilitator, Mustafa al Hawsawi, each received money, in some cases perhaps as much as $10,000, to perform their roles in the plot. According to KSM, the Hamburg cell members each received $5,000 to pay for their return to Germany from Afghanistan after they had been selected to join the plot, and they received additional funds for travel from Germany to the United States. Sheikh Mohammed's arrest in Rawalpindi, Pakistan on March 1, 2003 marks one of the most important breakthroughs in the fight against al-Qaeda. The two key factors leading to his arrest was a bribe to an Al-Qaeda operative in the amount of $27 million, as well as information gained from the NSA electronic surveillance network, Echelon. Although the arrest was solely a Pakistani operation the FBI observed the arrest and was to a large degree invovled in the interrogation process. Pakistani officials claim that KSM remained in Pakistan for 3 days and then was subsequently moved to an undisclosed location by US officials. 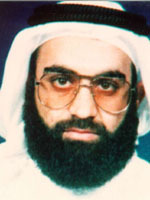 Reportedly, the use of harsh interrogation techniques in the questioning of Khaled Sheik Mohammed was approved by Justice Department and CIA, according to a May 13, 2004 New York Times report.